While logged into Outlook Web Access (OWA), click the “Gear Icon” in the upper right. This will be located next to your Username. The username in the example below is Gilgamesh. Next, click the words “Change Password”. 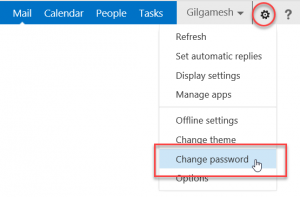 NOTE: You can only change your password from OWA. It is not possible to do this from within Outlook. password in the “New Password:” and “Confirm new password:” blanks. When finished, click “Save”. If your new password and confirmed password do not match, you will be asked to try again. Your password may not contain your full name or part of your full name. If your passwords match, and the meet the complexity requirement, you will be immediately taken to a new login screen. 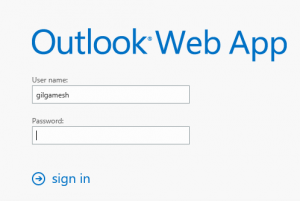 Log in with your username and new password to start your Outlook Web App mail session. If your new and confirmed passwords do not match or meet the complexity requirement, you will get an error message. Click OK to try again. 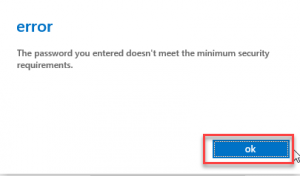 If you use a stored password with Outlook software installed on your computer, you will need to enter your new password when you next open Outlook. When the security window opens, be sure to enter your username in the hccanet\username format. 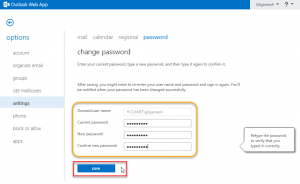 If you want Outlook to remember your password each time it starts, be sure to check the “Remember my credentials” box. Any mobile device you use to connect to your Exchange e-mail will also require changes to stored passwords. Because of the variety of phones and flavors of operating systems on mobile devices, screen shots will not be provided. However, you will need to change the stored password for the Exchange account, probably in the ActiveSync settings.